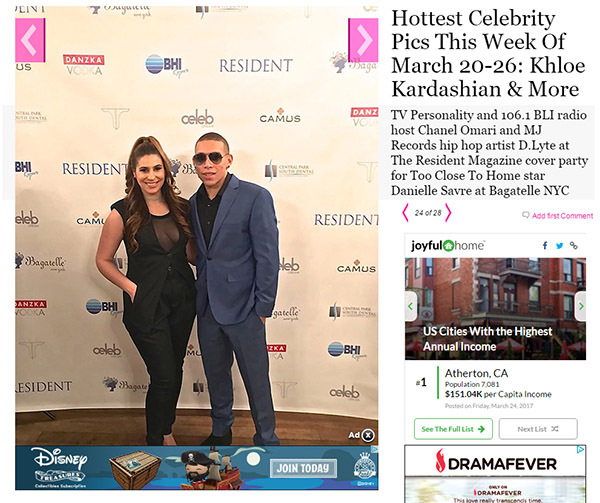 HERE’S A SNEAK PEEK OF PHOTOS FROM DANIELLE SAVRE’S EVENT THIS PAST WEDNESDAY, MARCH 22, 2017, AT BAGATELLE. Stay tuned for more photos from the event. 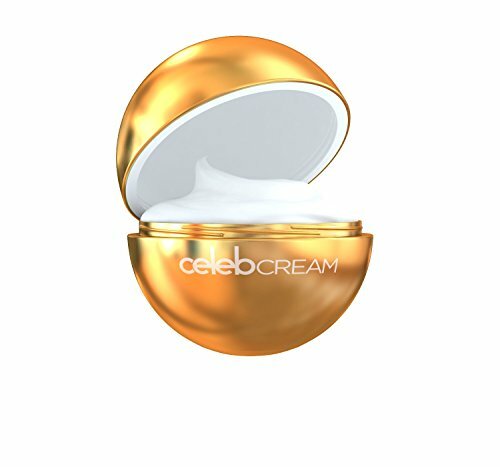 Powered by the cutting edge PharmaAdvance Technology, Celeb Cream is an all-in-one anti-aging complex infused with sophisticated blends of the most effective patented peptides clinically proven to reduce appearance of wrinkles. is a cell-communicating peptide complex with the ability to smooth wrinkles and provide firming benefits to aging skin. In fact, research shows that this peptide provides a dramatic reduction in the appearance of depth, surface area, and volume of wrinkles. Combined with Ceramide 2, which strengthens the skin barrier, this is one of the most advanced anti-aging ingredients of the 21st century. is a combination of tripeptide and tentrapeptide, making it doubly effective at fighting aging, while remaining gentle to the skin. In addition to having anti-inflammatory properties, it provides similar benefits to Retinol, without irritating side effects. Clinically proven to provide anti-aging effects, Matrixyl 3000 increases collagen synthesis. An improvement in skin clarity and elasticity are achieved with this ingredient. Not actually an acid, this ingredient is produced naturally within the human body and can hold 1000 times its weight in water, making it the ideal ingredient for giving a skin plumping appearance. It works effectively in this cream to help skin retain moisture. helps to reduce the appearance of frown lines and furrows between the eyebrows, while stimulating the growth of collagen. Sensuous shapes, brilliant diamonds, opulent natural hued stones, rare decorative materials, intriguing colored metals and innovative technology enraptured those who seek the pure essence of luxury and own it with finesse. Daniel Lazar has been an influencing member of the jewellery industry for nearly 20 years in a high profile role introducing creative and innovative pieces to the World market. In 1999, Mr. Lazar’s primary focus became the luxury timepiece market. Here his design knowledge of fine jewels and gems was influential in the production and creation of several well-known brands. Daniel Lazar’s intuitive sense of elegance dressed in precious metals, rare and natural stones and fine diamonds has given timepiece couture a fresh and polished look. Celebrities, actors, athletes, musicians, and those who set trends in the fashion industry wear the high-end timepieces created by Daniel Lazar. 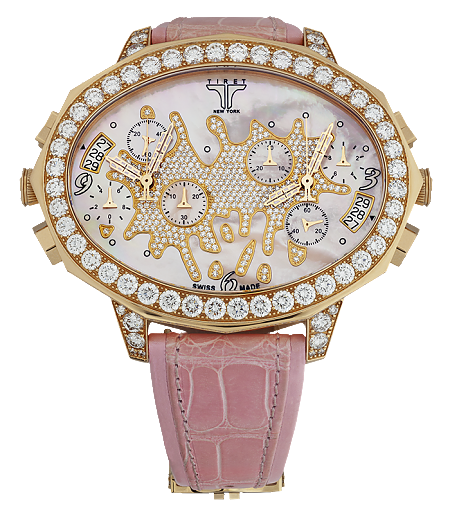 de Geneve 2005,” Tiret positioned itself at the top of luxury brand timepieces. FOR TIRET, AT THIS LEVEL OF LUXURY, ANYTHING IS POSSIBLE. 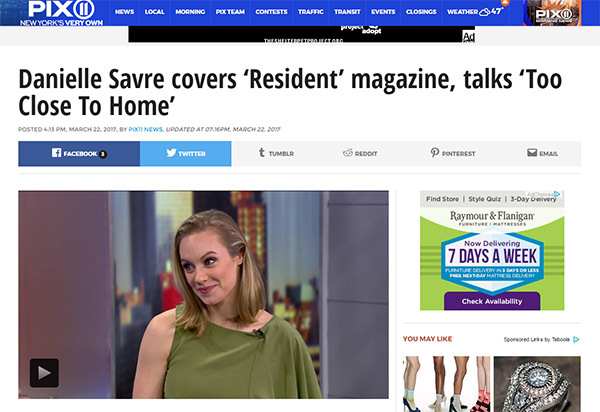 When Danielle Savre makes an entrance the whole room lights up and you can’t help from being swept away from her infectious charisma and positive energy. This talented actress is known for portraying different roles in independent movies and TV shows, but her true talent shines in her current breakout role as Anna, the lead in Too Close to Home, Tyler Perry’s latest drama airing on TLC. As someone who is always on the go, she is able to adapt to any situation, no matter how challenging. Here Danielle opens up to Resident about how she identifies with her new role and which barriers she had to break down to achieve success. RM: Tell us a little bit about your role and this new show. RM: Do you identify with the character? DS: Well, I never had an affair so I can’t identify from that perspective. But, I think I can absolutely identify with someone that is trying to better their lives and in the process they hurt the people they love and in general make some pretty bad decisions. Anna’s life was pretty amazing before everything unraveled and the affair with the president went public. Unfortunately, that life was just a façade. She was Alice and she fell down the rabbit hole. And, Sadly in the process of Anna’s bettering of her life, she also abandoned her own daughter. So as much as I can identify with Anna, luckily the mistakes I’ve made haven’t been as severe. So yes, I absolutely connect to certain aspects of her. RM: You leave things behind. DS: You do. Sometimes you do have to leave certain elements of your past behind. I’m currently in love with Lukas Graham’s song Seven Years. He talks about how he had some friends in his past he had to let go of. And that song resonates so much with me because there are some people that played a huge part in my life at certain times, but are no longer around. Unfortunately, in Anna’s case she began to lose herself along the way. RM: How did you meet Tyler Perry? DS: I got the script and absolutely loved that Anna is this flawed protagonist, something so unique to come across. After I said I was interested, Tyler Perry flew me out to Atlanta to read for him and we just connected. There was this strong energy immediately when I walked into the room. It felt like, “It was meant to be. These are the people I am meant to work with.” Tyler gave me a couple of compliments about my performance and the next day I was hired. I cherish those compliments the more I get to know Tyler. I have learned he isn’t one to constantly boost the actor’s ego so when he does have a compliment to give it holds so much more weight. RM: Tyler Perry is really known for his comedies more than his dramas. DS: I didn’t even know about his dramas before I signed on! I only had known of his comedies, as well. So I did my research and while I was watching his dramas I was in awe of how he is very how good he is at sucking you in with his writing style. I began to get so excited since I knew he was going to do that with our show as well. Adding to that excitement was that he announced before filming that our show would be nitty and gritty. He made sure we had barely any make-up, our hair would be completely undone, and our wardrobe was to look worn. Which is a scary thing for any actor about to film in high definition! He said “I want you to look and feel like the real characters I have written.” I embraced that and love that we are not sugar coating these peoples lives. RM: This is your first time with New York Fashion Week. How was your experience? DS: The first day I was so nervous, I was shaking. I just wanted everything to be perfect, but now that I’ve done it and realized fashion is just another form of expression, I feel comfortable with it all. I love every designer, stylist and photographer I have met. They have all been so welcoming to a fashion newbie like me. And obviously being dressed in stunning designer outfits is a dream come true. RM: Who are some of your favorite designers? DS: Designers like Zac Posen, Alexander McQueen and Club Monaco always hit the classy, chic mark, which I love. However during fashion week I was introduced to and fell in love with Nicole Miller, Chi Zhang and Miguel Vieira whose runway shows where such an inspiration and a unique experience. That being said, for my day to day I’m simply obsessed with H&M. It basically just takes classic chic designs off the runway and makes it affordable for everyone to buy. RM: Do you engage in social media to keep up with your fans? DS: I do and I love it. Instagram is my favorite though! I love taking pictures. Twitter challenges me to keep what I need to say within 130 characters. For anyone who knows me that’s a difficult task! But of course, Facebook is the best way to stay in touch with childhood friends and to reach a global fan base. I’m learning how to try stay on top of it all! RM: With your live tweeting parties on Wednesdays for the shows airing do you ever get any pranksters? DS: We haven’t gotten any pranksters yet. I did learn about trolling though when I encountered a few during my first Instagram live video. But as far as during our tweeting parties I don’t believe we have had to deal with that at all, just our awesome fans! RM: Are you always on the go? DS: Yes, always on the go! I basically live out of a suitcase. I’m born and raised and still based in LA, But I frequent New York constantly. I am currently on a press tour so after this I go to Indiana, Chicago and then back to LA. I am in Los Angeles for roughly about a fourth of the year, usually 5-7 days at a time. As crazy as it can be though, I still love it! Getting to meet new people, and experience different cities is very fulfilling. I don’t see myself slowing down anytime soon! RM: Do you come from a family of actors? DS: No not at all! My mother was a counselor and my father worked for the electric company. I had to beg my mother to be an actress. I was this super hyper kid who had a very wild imagination. Luckily, my best friend’s mom in second grade, who was an assistant to an agent convinced my mother that “You need to get Danielle into acting.” It took a while but eventually my mother took me to see the agent. I booked my first job and from then on continued to fall in love with the act of storytelling and emotion being captured on camera. Being on set, is where I feel the most comfortable, where I feel I belong.